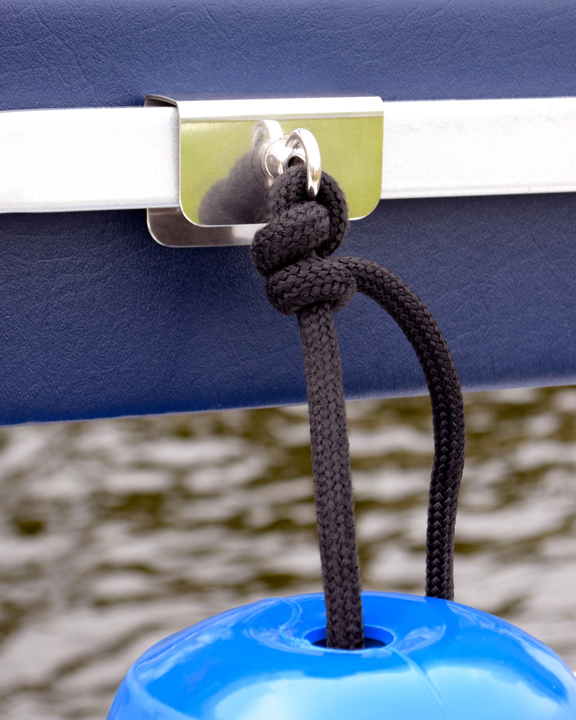 The Square Rail Adapter (SRA-1™) for pontoon boats with 1.25" rails. Made of 316 stainless steel, the SRA-1™ simply slides between your pontoon boat's seat back and rail to provide a strong 316 stainless steel eye for your fender. The eye is laser welded to the adapter and can be used with any diameter line up to 1/2". Underneath the SRA-1™, you will find 3 pieces of 3M's 370 antislip tape. This tape protects your rail and prevents the SRA-1™ from moving sideways. Use the SRA-1™ in conjunction with a FENDERGRIP® push button fender adjuster for the ultimate fender set-up. This entire website and contents; including logos, text, videos and images, are protected under International Copyright laws and cannot be reproduced, or used, without the written approval of New World Marine, Inc.
© 1992 - 2019 by New World Marine, Inc. All rights reserved. of New World Marine, Inc.